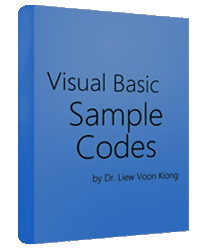 Visual Basic programming is so simple that sometime you just need to write a one line code to create a wonderful tiny little but nice application. For example, you can write a one-line code to create a digital clock. In this program, you have to insert a timer control into the form . Then go to the properties window to set the timer's interval value to 1000 so that Visual Basic updates the time every 1000 milliseconds, or once a second. Other properties that you ought to set are to change the caption such as "My Clock" and to set Form1's MaxButton to false so that it cannot be resized by the user.